Starring: Paul Rudd, Michael Douglas, Evangeline Lilly, Corey Stroll, Bobby Cannavale, Judy Greer, Michael Pena, T.I. The signs for Ant-Man didn’t look great. A director who was removed under mysterious circumstances, only to be replaced by a director known more for rom-coms. A leading man who is also known mainly for frat boy comedies and rom-coms, who took over writing duties along with the co-creator of Anchorman. Could this be the film that finally proves that Marvel are not indestructible? Absolutely not! In fact, not only the biggest surprise of the year but can we say Guardians of The Galaxy in the same breath? I think we can! Dr Hank Pym needs help. He needs someone to infiltrate his own company to steal a tiny suit that is being developed by his protegé, Darren Cross. This suit is a weapon that, if Cross can find the right formula, while be able to shrink a man to a tiny size to wear the suit. Pym turns to cat burglar and recently released from prison, Scott Lang. Desperate to go straight, Lang is set up to steal from Pym’s house, only to find Pym wanted him there and for him to steal from Cross, as Ant-Man. This is a very different Marvel production, in every sense of the word. Having original script writers and story creators, Edgar Wright and Joe Cornish, with re-writes by Paul Rudd and Adam McKay, this is not just another action superhero movie. This is a comedy with a costume. It is laugh-out-loud funny. Then even the feel, the tone, the whole rhythm has changed. Even though this is big, blockbuster stuff, it feels, excuse the pun, small. There aren’t as many set pieces and when they do happen, they aren’t of the grand scale of previous outings. While the Avengers maybe destroying New York or some eastern European country, Ant-Man’s denouement occurs in a little girl’s bedroom. Yes, it’s that small. Yet even though it isn’t crash, bang, wallop like past films, it still is incredibly exciting and still incredibly funny. The real strength of the film is the casting. 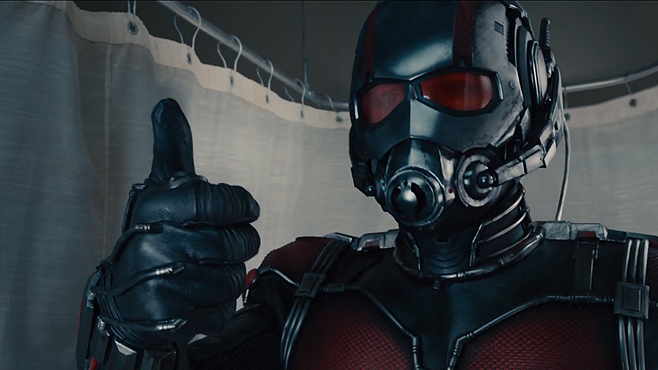 Paul Rudd might not sound the ideal choice for a superhero movie, yet it works. With his charm, everyman quality and comic approach, he balances the humour with the pathos, while proving he can handle the action well. Michael Douglas brings a huge amount of gravitas with him as Henry Pym. Sporting goatee and distinguished grey hair, he still has that Gordon Gekko quality about him, that even the most complex techno-babble sounds easy to understand in his hands. 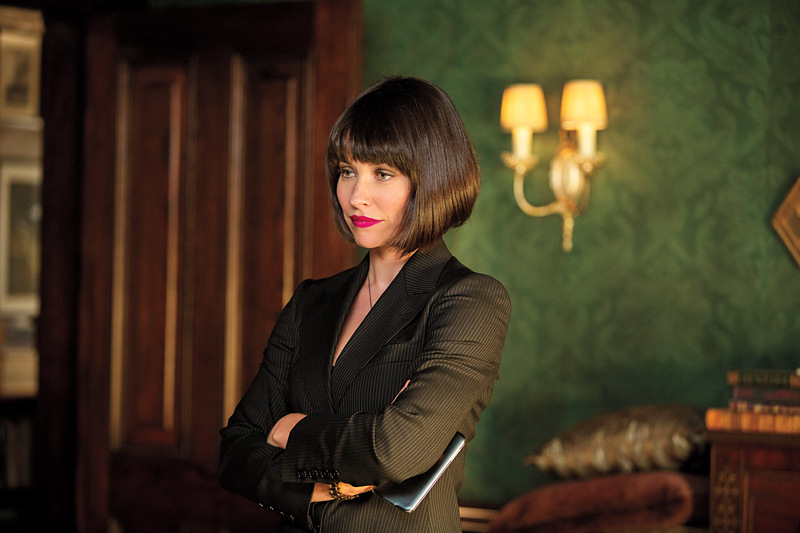 As Henry’s daughter, Evangeline Lilly can certainly handle the action, as proven in The Hobbit and is given room to create a tough, independent woman in Hope. 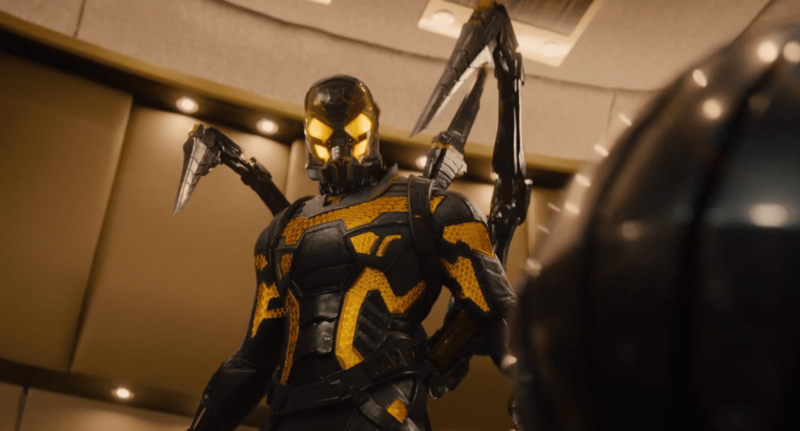 Corey Stoll makes for an impressive villain as Darren Cross, while Michael Pena is the biggest thief, stealing every scene he is in as Scott’s partner-in-crime. Marvel’s Phase 2 of their cinematic universe looks a bleak and dark place, yet Ant-Man is a delicious slice of fun, with the audience I saw it with lapping up every minute, applauding the film every chance they got. It’s a terrific new entry in this world and I get the feeling this isn’t the flop that everyone predicted it would be. A real blast and you’ll never look at Thomas The Tank Engine in the same way.